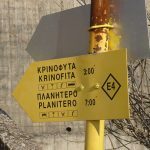 Hiking in Crete - walking and hiking with routes and pictures. 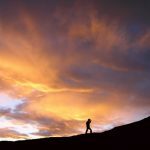 Hiking is one of the best ways to enjoy the beauty of Crete and its countryside. We have provided a guide for all those budding walkers who want to explore the mountains and valleys of this wonderfully picturesque country. As always when hiking in Crete or any foreign country its recommended that you always walk in groups of 2 or more, also carry enough water for your journey. The weather in Crete during the summer months is very hot and the area arid and dry. Always study the maps for the correct distances before you set off. In this hiking guide we have covered one hiking trail which covers the mountainous area of Lassithi. Starting from Agios Nikolaos, the capital of the region that includes Ierapetra, Mirtos, and Kalo Chorio, you reach the village of of Malles. This village is built at the southeastern foothills of the Diktian Mountain on the site of the ancient town of Malla. Follow a westerly direction on the gravel road to Mathokotsana. Walking towards the church of Aghios Efstathios, you pass by the farmhouses of Selakano where you can have a simple lunch in one of the cafes under the shade of the pine and oak trees. The local climate is very refreshing and even in the hottest summer months of July and August the vegetation remains lunch and green. Along the small path which goes up to the village of Metaxochori, it is worthwhile to stop and take some photographs of the old houses of the village that still retain the local architectural style (durable, attractive and practical constructions), and also of the small but interesting Byzantine churches. Your next stop is the small but beautifully sited village of Christos. At the oak covered height of the church of Aghia Paraskevi with its abundant supply of water you have the opportunity to eat in one of the two Tavernas there. Continue on and you will reach the end of the village that was your starting point. At Malles, time permitting, you should visit the Byzantine church of The Virgin Mary (1431) which has very well preserved wall paintings. A popular company that organised walking and hiking in Crete Crete is Cretan Adventures and you can check more walks on their website also. 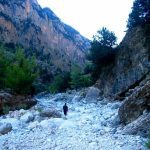 If you are really into walking in Crete and Greece then we found a very useful and informative walking website by Ton De Maagt a keen walker and runner who has done his fair share of hiking in Crete.